Often when I do a challenge like this, I wear multiple outfits in a day and go ahead and take photos of them. For example, something to work in and run errands during the day, then I change for an evening out. It usually allows me to get ahead in the challenge so I don't always feel like I'm playing catch up. In the case of 30x30, this has been true. 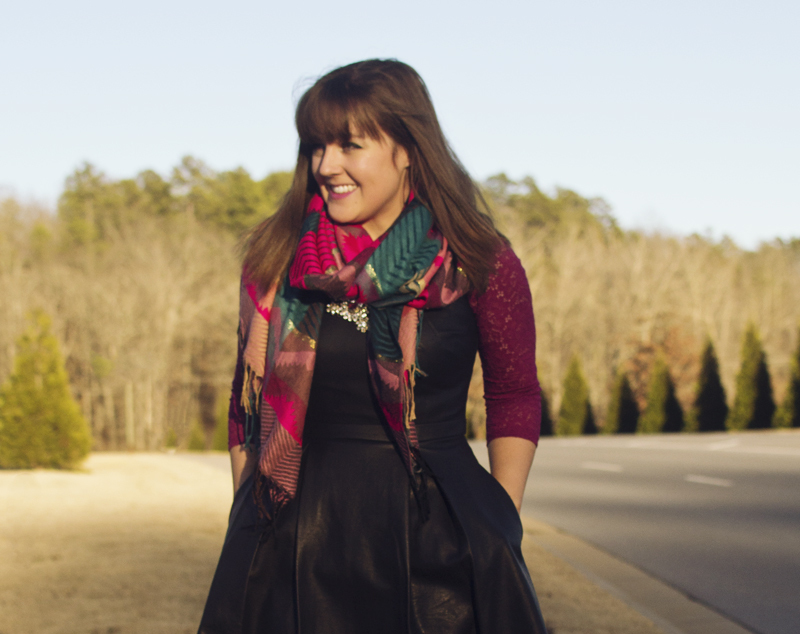 But by only tackling one outfit a day (and falling behind occasionally on weekends) I'm still blogging outfit to outfit. Since I'd love to wrap this up this week, I'm cramming my last five outfits into today and tomorrow's posts. I hope you'll forgive me. At least I didn't give up all together! 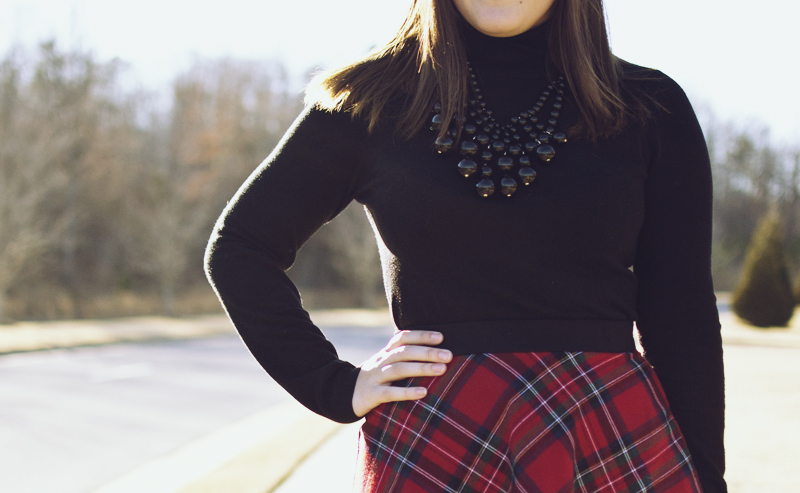 Outfit 26 :: Plaid Skirt + Black Turtleneck. I'd actually tried this turtleneck sweater with my Kate Spade skirt in an attempt to make it look all black chic or like a dress, but it did NOT work. I ended up changing immediately. I don't mind it with the plaid skirt, though. Plaid Skirt, XXI. Turtleneck, Limited. Necklace, Baublebar. Flats, Zara (gorgeous similar from Nordstrom). Outfit 27 :: Jeans + BF Blazer + White button up...and how are those for some crazy shoes? I admit they're kind of weird and tacky, and I'm sad I didn't get a better picture of them, but they really speak to my Texas side. Also they were only $15. Also, this blazer is looking pretty shabby these days and it might be time to replace it with a nicer one. Also, these jeans are ridiculously skinny. I'm looking for a nicer pair of those as well. Jeans & Bag, JustFab. Blazer, Target (similar Mango). Shirt, Forever 21. 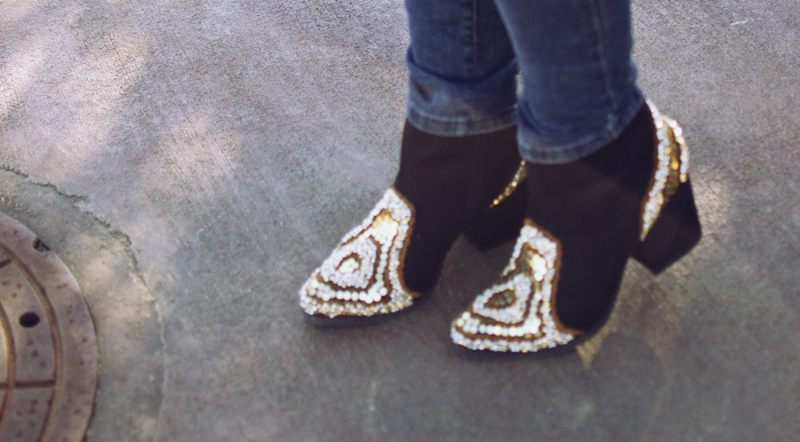 Boots, Michael Antonio (love these, if you're looking for obnoxious boots too). 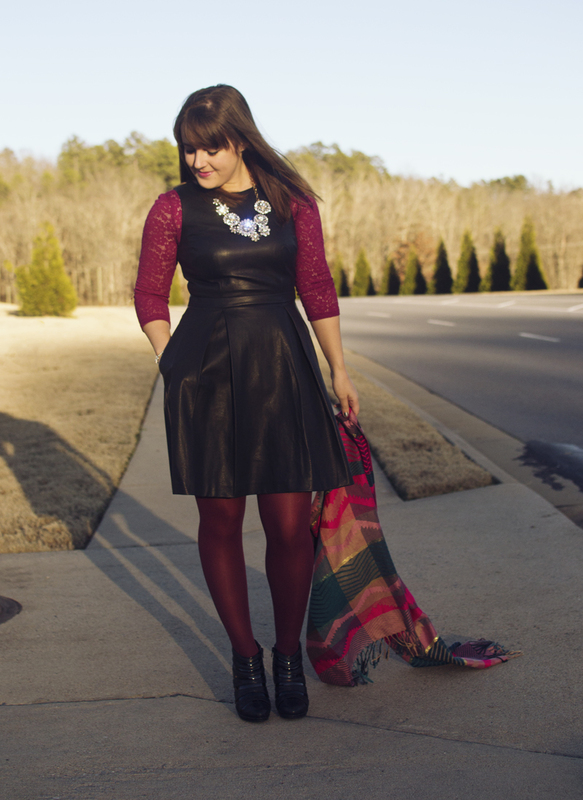 Outfit 28 :: Leather Dress and lace peplum. I actually took this WEEKS ago and somehow glossed over it when I was uploading photos! Layering a shirt under a dress is one of my favorite remixing tricks, and I could have easily done this with the turtleneck, button up, or striped shirt as well if I'd decided to keep this going for a few more months! Dress, The Limited (similar Target). Lace top, Express (similar - many colors - Delia's). Scarf, Forever 21. Boots, Isola (similar DSW). So there you have it. Three outfits in one day. Tomorrow I'll put up two more (trying to not overwhelm you with excitement, of course) and Friday we'll have the 30x30 wrap up! HURRAH. HUZZAH. New clothes for new outfits in a week!